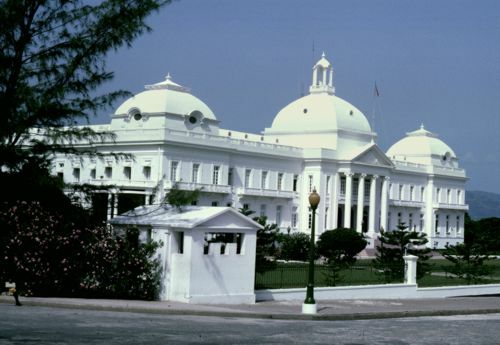 Palais national, Champ de Mars, Port-au-Prince. Photo Fabio et Franco Biaggi. If the coming elections happen with transparency, the Haitian people are not blind and stupid. As the saying says, “Analfabèt pa bèt” (Being illiterate does not mean that one is stupid). They will decide who to vote for in the sense of voting a candidate who has shown cares about Haiti’s future, a candidate with strong records in the past, one who has done positive things in the society before, but not based on how many degrees that person has amassed from universities in Haiti or abroad. It’s about time to let democracy reign over Haiti! And Haitians shouldn’t try to impede it in any possible way. They should, instead, pray that these elections happen peacefully and in transparency. I doubt anyone expect the deadly surprises of Ruelle Vaillant (December 1987) where so many of our beloved country fellows were gunned down by the macoute sector just because they were voting someone they thought to be their favorite leader. Whoever gets elected will be the Haitian People’s President and if no coup d’état or death happens afterward, will be governing for five years. Once this person gets elected, we should congratulate that person, wishing him the very best and start reminding him of the people’s claims (for the country) in order. There’s nothing wrong with doing that as a citizen and his task should be to take them into consideration. It’s about time that Haitians focus on “strategies to move Haiti forward” instead of on particular parties with no agendas. “Political stability” is also something crucial that the Haitian people need in order for Haiti to move forward. The children of Haiti are tired of coup d’états back and forth. There have been over thirty so far and every time there’s one the country goes backward for many years. Of course we can always critique some leaders in a democratic system (be they are in power or not and). That’s fine! It’s only dictators who don’t like critiques but praises all the time because they don’t want to do everything with transparency. The new president of Haiti should certainly include people from all parties and background and genres in his government (as long they have a clear record and have shown that they really care for the country’s future). One of the key reason why Haitian politics fail is that the party in power always takes power as a private garden, as “chwal papa” (a daddy’s horse – that they can run the way they want to) and exclude those who are not members of their party or their entourage. So, the whole cake is for members of the party, nor for outsiders. The new formula for success is that Haitian politicians should see power with some new eyes: a whole “konbit” (collective work) where everyone is working together to achieve one goal and here, that goal would be: Haiti’s development and at the same time, there will be advantages for those who take part in that great ‘konbit’. Many fans who support “a party” just want, most of time, “a job”, or “favors” if their candidate ascends to power but, nothing else in the sense of seeing a country’s needs and how they bring their own contribution. This lack of vision and unity tells it all in order to understand where Haiti is where she is. But, a real Haitian who dreams of changes for Haiti at all levels shouldn’t be a fan of any particular party, but instead encourage them to work together, to have a vision for their country and how to develop strategies to reach that goal. Certainly, inside us, we sometimes know who we would vote for, based on certain criteria dealing with the candidate’s record but again, as the Haitian saying says “sekrè pa pouri trip chen” (secrets do not spoil a dog’s intestine), therefore we keep them to ourselves. Long live Ayiti Cherie! And good luck to Haiti’s next president. Bòn chans a pwochen prezidan Ayiti a! Si eleksyon ki pral vini yo fèt nan transparans, pèp ayisyen an pa avèg ni estipid e kòm dikton an di, analfabèt pa bèt donk yo va deside pou kilès y ap vote. Nan sans vote yon kandida ki montre sousi l pou fiti Ayiti, youn ki ta gen bon jan dosye lè n gade dèyè, youn ki fè (kèk) bagay pozitif nan sosyete a avan, men se pa baze sou ki valè diplòm moun sa a ranmase nan inivèsite Ayiti ou aletranje. Li lè li tan pou demokrasi reye sou tout Ayiti! E Ayisyen pa dwe eseye bloke sa pa oken fason posib. Yo dwe, pakonsekan, priye pou ke eleksyon sa yo fèt nan lapè e nan transparans. Mwen doute ta gen moun ki ta espere sipriz mòtèl Ruelle Vaillant yo(desanm 1987) kote anpil frè ak sè nou yo te mouri anba bal sèktè makout la jis paske yo t ap vote yon moun yo panse ki ta lidè favori yo. Kèlkeswa moun ki eli a, se li ki pral Prezidan Pèp Ayisyen an e si pa gen oken koudeta aprè oubyen lanmò, li pral gouvène pou senkan. Yon fwa moun sa a eli, nou dwe felisite l, swete l lemeyè epi fè l sonje revandikasyon pèp la (pou peyi a). Pa gen anyen mal pou fè sa etan sitwayen epi bi li ta dwe la pou pran sa an konsiderasyon. Li lè li tan pou Ayisyen santre sou estrateji pou fè Ayiti ale vè lavan olye yo chita ap konsantre sou pati politik an patikilye ki pa gen okenn ajannda (pou Ayiti apa monte sou pouvwa). Estabilite politik se yon bagay tou ki enpòtan ke pèp ayisyen an bezwen dekwa pou Ayiti ale vè lavan. Pitit Ayiti yo fatige avèk koudeta pasipala. Gen anviwon trant koudeta ki fèt deja, e chak fwa youn fèt, peyi a fè bak pou plizyè ane. Pa gen oken dout ke nou kapab toujou kritike kèk lidè nan yon sistèm demokratik (ke l sou pouvwa ou pa). Pa gen pwoblèm! Se sèlman diktatè ki pa renmen kritik men sèlman lwanj paske yo pa vle fè anyen nan transparans. Nouvo prezidan Ayiti a ta dwe, sètènman, enkli moun ki soti nan tout pati politik yo, moun ki gen diferan konpetans (fi kou gason) nan gouvènman l lan (osilontan yo gen dosye pwòp epi yo montre sousi yo vizavi fiti Ayiti). Youn nan rezon ki fè politik ayisyen pa gen siksè sèke pati ki sou pouvwa a toujou gade pouvwa tankou yon jaden prive, tankou chwal papa - ke yo ka galope lè yo vle, epi yo ekskli moun ki pa manm pati a oubyen ki pa nan antouraj yo. Donk, tout gato a pataje ant lafanmi, pa gen pou etranje. Nouvo fòmil siksè a sèke politisyen ayisyen dwe wè pouvwa ak zye nouvo: tout yon konbit kote tout moun ap travay ansanm pou atenn yon bi, e bi sa a se devlopman Ayiti e an menm tan, va gen avantaj pou sa yo ki patisipe nan gran konbit sa a.
Anpil fanatik ki sipòte yon pati jis vle, anpil fwa, yon dyòb, oubyen favè anka kandida yo a ta monte sou pouvwa men, pa gen anyen ankò - nan sans wè bezwen yon peyi, e kijan pou pote pwòp kontribisyon yo. Mankman vizyon sa a avèk tètkole di tout bagay dekwa pou konprann sa k fè Ayiti kote l ye jounen jodiya. Men, yon vrè Ayisyen k ap reve chanjman pou Ayiti nan tout nivo pa dwe fanatik oken pati an patikilye, men pito ankouraje yo travay ansanm, pou gen yon vizyon pou peyi yo epi kijan pou devlope estrateji pou atenn bi yo. Sètènman, nan kè nou, nou konnen pafwa pou kilès nou ta vote, baze sou sèten kritè ki gen pou wè ak dosye kandida a men ankò, kòm pwovèb ayisyen an di, sekrè pa pouri trip chen. Pa konsekan, nou kenbe sekrè nou pou nou. Viv Ayiti cheri! Bòn chans a pwochen prezidan an!